TOKYO--(BUSINESS WIRE)--London, New York, Tokyo and Paris were again named the world’s most comprehensively attractive cities, in that order, in the Global Power City Index (GPCI) 2018 report published today by The Mori Memorial Foundation’s Institute for Urban Strategies, a research body established by Mori Building, a leading urban developer in Tokyo. The annual GPCI report has ranked 44 major cities in terms of “magnetism,” or overall power to attract creative individuals and enterprises from around the world, since 2008. Cities are rated in terms of 70 indicators in six categories: Economy, R&D, Cultural Interaction, Livability, Environment and Accessibility. The top four cities remain unchanged from last year, with London, New York, Tokyo and Paris maintaining their respective one-through-four positions. London continued to surge ahead and even increase its score by further leveraging the undiminished momentum of the 2012 Olympic and Paralympic Games. The city upgraded its previously weakest category, Livability, and continued to show overwhelming strength in Cultural Interaction. While uncertainty exists regarding the U.K.’s exit from the EU, balanced strengths across several categories give London the potential to turn challenges into opportunities, extend its commanding lead and continue forward as the top-ranked city. With the global financial crisis finally behind it, New York marked its highest one-year score increase since the GPCI rankings began, as it benefits from the effects of a strong evaluation in Startup Environment and Variety of Workplace Options. New York also maintained its top position in the both field of Research & Development, and Economy due to improved results in Corporate Tax Rate. Potentially negative impact on U.S. GDP growth due to trade friction could influence New York’s future ranking, and Environment and Livability remain significant weaknesses. 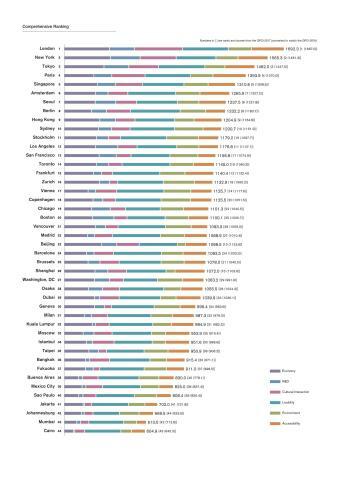 Tokyo, in the top 10 in all categories except Environment, broke into the Livability top 10 with improved Total Working Hours. Tokyo has boosted its score every year since 2015, but was relatively low in Commitment to Climate Action and dropped from #12 to #29 in Environment. Like London in 2012, Tokyo hopes to build on its score before and after hosting the Olympic and Paralympic Games in 2020. Paris, after slipping to fourth following multiple terrorist attacks in 2015, recovered to boost its overall score, including in Number of Foreign Visitors. With the Paris 2024 Olympic and Paralympic Games now official, Paris will likely compete with Tokyo for Games-related growth. Singapore (#5), traditionally strong in Economic Freedom, Corporate Tax Rate, and International Conferences, now ranks first globally in Employee Life Satisfaction and first in Asia for its Startup Environment. Improvements in Number of Foreign Visitors and high scores in Number of Foreign Residents established Singapore as Asia’s leading international business hub. Amsterdam (#6) continues to be ranked favorably as a supportive, tech-ready city for business. The city was first in ICT Readiness and eighth in Startup Environment, and was evaluated as offering a high quality of life, including ranking second in Employee Life Satisfaction behind only Singapore. Amsterdam, along with nearby Frankfurt (#15), also gained a high rank in Accessibility (6th overall). Seoul (#7) once again scored highly in Research and Development, third in Number of Researchers, fifth in Research and Development Expenditure, and second in Number of Patents. In the Environment category, it led all Asian cities in Commitment to Climate Action (14th overall) and Waste Recycle Rate (1st overall). Berlin (#8) achieved the top ranking in Livability as well as sixth overall in Cultural Interaction for its abundant opportunities in this category. Berlin possesses strengths in Environment, leading Europe (fourth overall) in Waste Recycle Rate and first among the top 10 (fifth overall) in Green Coverage. Hong Kong (#9) was fifth overall in the Economy category. Business-friendly policies placed the city first in Economic Freedom and second in Corporate Tax Rate. Thanks to its well-functioning port, Hong Kong was first in International Freight Flows. It was also first in Asia (third overall) in World’s Top Universities. Sydney (#10) scores fifth in Economic Freedom and seventh in Variety of Workplace Options. It also excelled in Environment, ranking first among the GPCI top 10. Its excellent air quality was rated first in SO2 and NO2 Density and fourth in SPM Density. Sydney was also sixth in Commitment to Climate Action.